Rick and Morty and Adventure Time aren’t the only modern animated shows to get the card treatment. 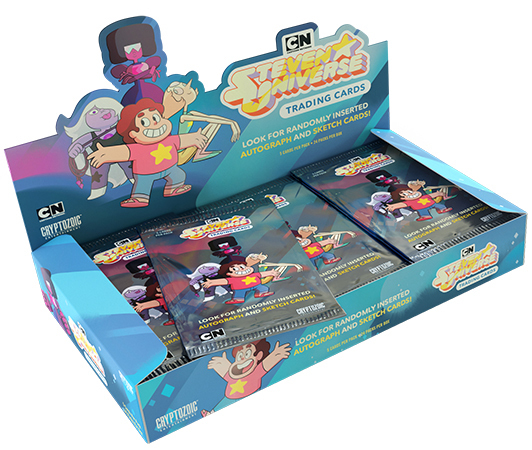 2019 Cryptozoic Steven Universe trading cards mark the hobby debut for the popular Cartoon Network show. Following a similar format to Cryptozoic’s recent Rick and Morty offerings, the set has a broad mix of card types. Among them? Autographs and sketch cards. The base set has 72 cards. These cover episodes from the show’s first five seasons as Steven not only protects his home of Beach City, but discovers who he is and why he’s so special. Randomly inserted autographs feature the show’s cast while sketch cards all come with original artwork. Hobby boxes have both a sketch card and an autograph. Joining these are six additional insert sets: Crystal Gem Friends, Dazzling Diamonds, Fusions, Greatest Hits, Scratch and Sniff, and Stickers. Base cards and select inserts also have foil parallels and printing plates. Rounding out the product is a custom binder. Sold separately, it comes with an exclusive card not found in packs. 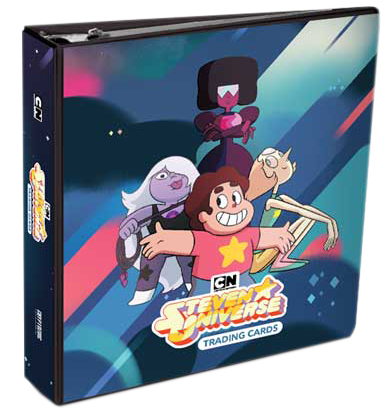 The first 2019 Cryptozoic Steven Universe trading cards are in the February/March issue of Non-Sport Update magazine. Each issue comes with one of three different promo cards. Cryptozoic also has additional exclusive promos for Emerald City Comic Con and WonderCon that will be handed out in March. Cryptozoic has been producing digital Steven Universe trading cards and stickers on the Quidd app for a while now. It remains one of the app’s most popular channels. No date has been set for the release. Cryptozoic is currently targeting sometime in the second half of 2019.